and closed us in half-hour before twilight. => Clear and photometric night with average seeing. => Clear night with very bad seeing. => Clear sky. Unstable seeing. We were closed by humidity after 3 hours of observations. => Bad weather. Were closed by strong wind and high humidity. => Grey to dark night with thin clouds and bad seeing. Bruno Letarte (SAAO) is visiting SALT for a few days. He captured an excellent time lapse of the sky last night, over the new LCOGT domes on the other end of the plateau from SALT. You can watch it at the link below. His camera is inside of the dome tonight, so keep your eyes open for more! While trying to make observations of a nearby galaxy, SALT managed to catch an even closer by object. On July 16, SALT made observations of Uranus! On its right there is the moon Titania and to the left Oberon. Miranda, Ariel and Umbriel happen to be too close to the planet to see. 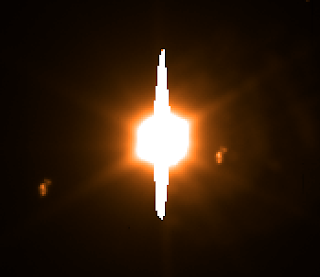 The white vertical line is not the ring system, but saturated pixels from the very bright planet. Long day of Salticam repairs extended through the night. Did not get on sky (it was very nice), but all should be ready for tomorrow. Clear but humid start of the night, then finally got on sky at 1am when the wind changed. Others: not even us, really..
Did not open - another icy day and night. down last night with the wind and thick ice accumulation. How sad. Lost the first hour to tech.issues and then humidity shot up. Light snow outside. No data. Windy clear productive night with mostly large seeing (2.5-3"). A few supernovae and quite a mix of things. Started out with high humidity but dropped after 22:30. --The Return of the King, VI, 2. We sleep, and at length awake to the still reality of a winter [evening]. The snow lies warm as cotton or down upon the window-sill; the broadened sash and frosted panes admit a dim and private light, which enhances the snug cheer within. The stillness of the morning is impressive. Silently we unlatch the door, letting the drift fall in, and step abroad to face the cutting air. Already the stars have lost some of their sparkle, and a dull, leaden mist skirts the horizon. --A Winter Walk, H.D. Thoreau. Thick-Heavy cloud and high humidity, did not open. Another windy bright night with consistently poor seeing (>2.5-3") and technical problems. Closed due to heavy clouds at 04:25. Bright night, clear but with poor seeing (> ~3"). Closed at 02:30 due to humidity. - entire nights lost to strong winds and cloud. a major cold front moved in. o- clear and stable photometric night, with good seeing. o- a very big warm welcome to our new operator Thea, nice to have you on board! o- productive night with good seeing, bright time targets only. - a frustrating night with variable seeing and technical issues.